Today I would like to introduce you to a keyword tool which is truly a gem for any SEO and keyword junkie. Meet SEMRush. 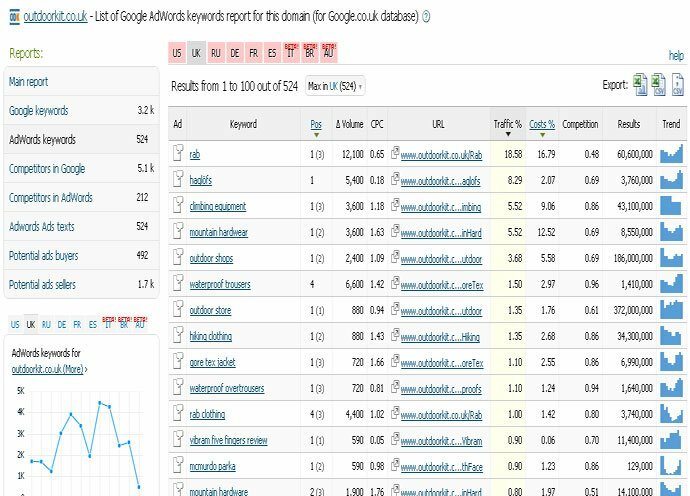 The kind of tasks it can perform in keyword research and competitive analysis is truly outstanding and I am just plain lucky to find this tool. Within a few minutes of reading my post you will have the same opinion. 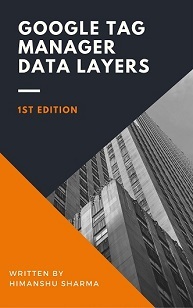 Here is how you can scale your keyword research. Average CPC of each keyword in US$ (check the CPC column). I hope the cost is available in pounds & other currencies too. Web page of the website which is ranking for the keyword (check the URL column). Just click on the page URL to find out other keywords for which the web page is ranking in top 20 on Google and getting traffic. What percentage of page total traffic is coming from the keyword (check the traffic % metric) . 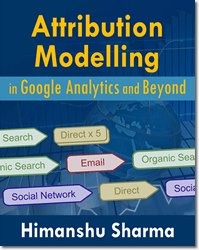 This is a really cool metrics and can help you in your keyword selection. You get an idea of how much traffic you can expect from a keyword if you rank at a particular position on Google SERP. Isn’t that cool??? Number of Google search results and seasonality of each keyword (check the results and trend columns). You would not first like to target a highly competitive keyword which is very seasonal for a non-seasonal SEO campaign. 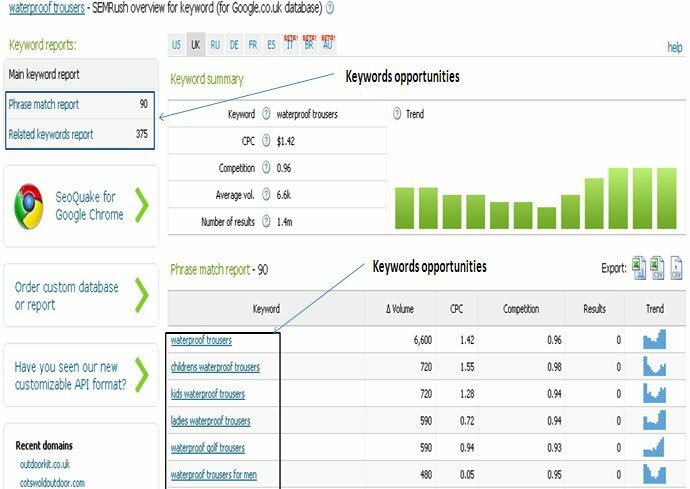 This is where keywords trends can help you in your keyword selection. Cost% and competition columns help PPC guys more. 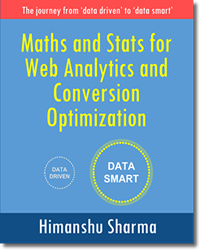 Cost% is the ratio of the estimated cost of buying the same number of visitors for a keyword to the estimated cost of purchasing the same number of targeted visitors coming to this site from Google search results. 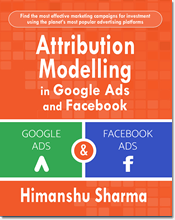 Competition metrics talk about the number of Google adwords advertiser bidding for the keyword. Higher is the competition, more valuable is the keyword. This is another key factor to keep in mind while selecting keywords. Advertisers won’t heavily compete for keywords which are not driving conversions. 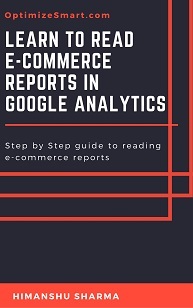 Even more cool thing about these reports is that you can download them into excel, sort the columns, separate branded keywords from non-branded keywords and do all those cool things which an excel ninja can do. 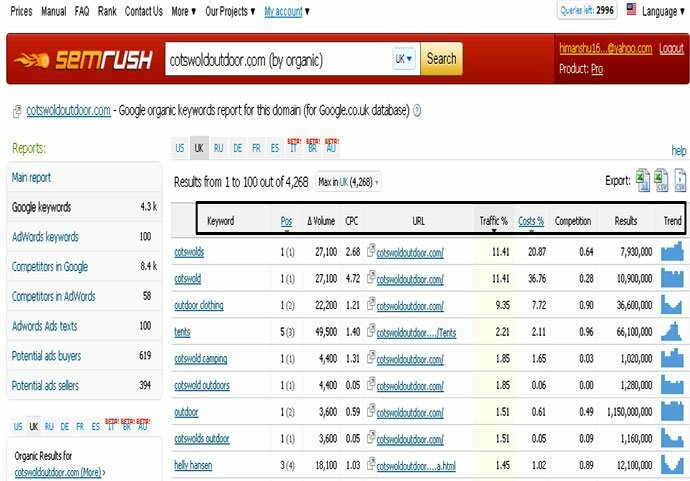 Before I discovered SEMrush, I used to follow a pretty tedious process of determining top competitors in organic search. Here is what i used to do. I created a list of top five or top ten primary keywords. Run SEOmoz keyword difficulty tool for each keyword. Download the top ten websites ranking for each keyword in excel. 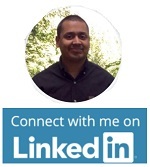 Manually highlight those websites which rank for majority of my targeted keywords to determine my top SEO competitors. This process is pretty time consuming, not very effective and is not scalable at all. If I wanted to determine top SEO competitors for say 100 keywords, then it would take me a day or two. If I wanted to determine top SEO competitors for say ten websites then it would take me weeks. The more clients, the harder the work. Here is the solution I have found. To determine top SEO competitors I simply clicked on the ‘competitors in Google’ link on the left hand side menu. And then just like Avinash style….. BOOM….Here we get a list of our top SEO competitors within seconds. The website Amazon is competing with Cotswold Outdoor for 2,933 keywords (check the ‘common keywords’ column). Therefore it is the number one SEO competitor. 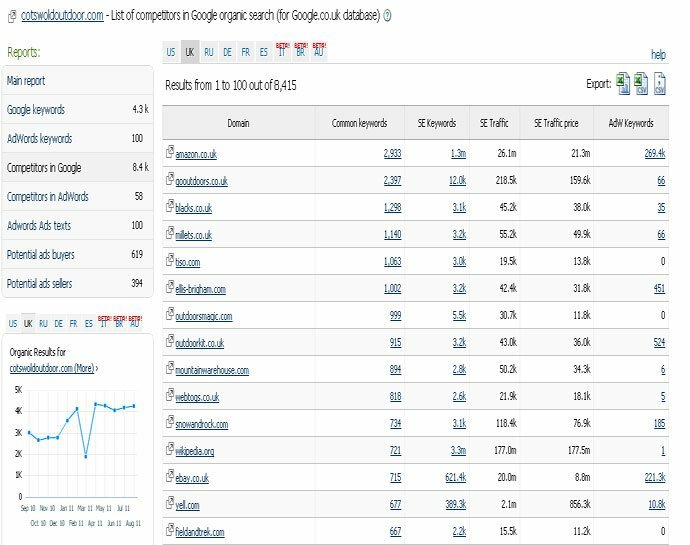 The website gooutdoors.co.uk is competing with Cotswold Outdoor for 2,397 keywords and that’s why it is their number two SEO competitor. 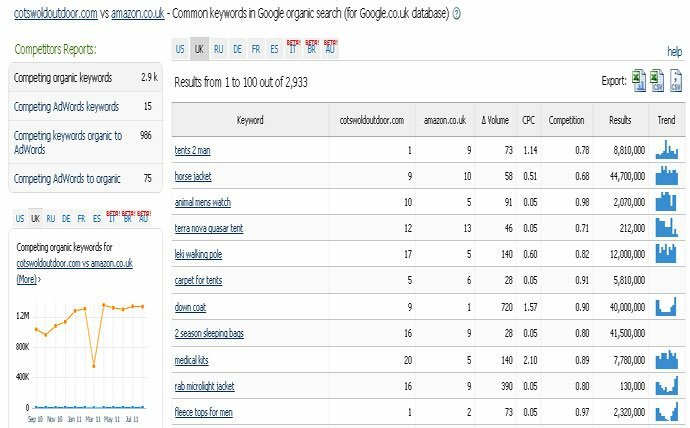 If you click on a common keywords link, you can determine the keywords for which website like amazon is competing with cotswoldoutdoor. Form the chart above i can see that cotswoldoutdoor is ranking pretty poorly (rank 16) for the keyword ‘rab microlight jacket’. This keyword has good search volume and I need to work on it. 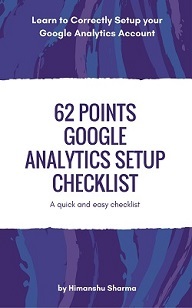 You can download this list into Excel, sort the list in decreasing order of SERP rankings and find out the keywords for which your competitor is outranking you. Similarly you can determine many hidden opportunities. Creativity is the key. You know, I believe in the why every SEO should know PPC theory. The reason is simple. By running PPC campaigns you can test your keywords and get a fairly accurate estimates of a keyword’s search volume and its potential to convert even before you target them via SEO. 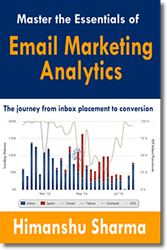 It can take several months to year to rank for your target keywords. So if you ended up optimizing your website for keywords which didn’t generate the traffic and conversions as you expected then all of your hard work (along with the client’s money) goes down the drain . For small clients running PPC campaigns just to test keywords can be pretty expensive and not all SEO consultants /agencies are comfortable with the idea of suggesting PPC to their clients in any way or form. Here is the solution. Determine your competitors who run PPC campaigns and then determine the keywords they are bidding on and traffic they are getting through these keywords. For e.g. 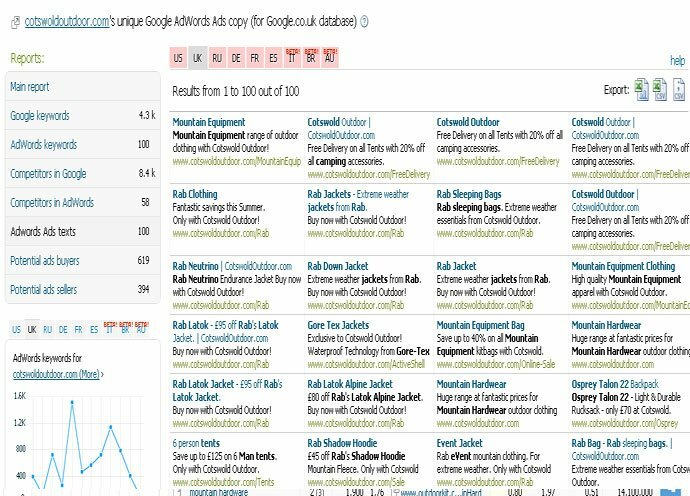 outdoorkit.co.uk is one of the top SEO competitor of the website cotswoldoutdoor.com and they also run PPC campaigns on Google. I clicked on the ‘competitors in adwords’ link on the left hand side menu to see this report. 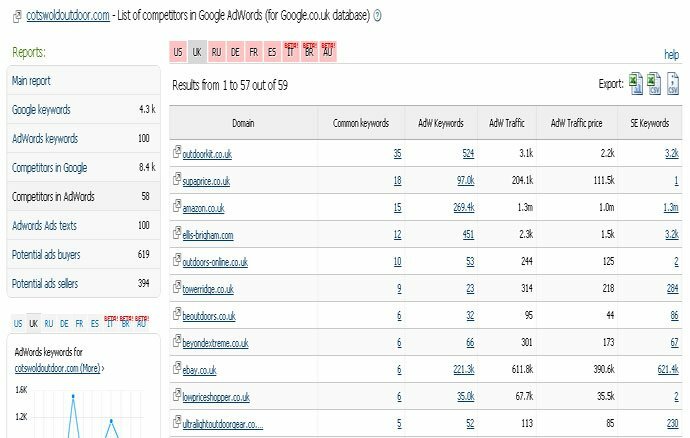 As you can see from the report, the website outdoorkit.co.uk is bidding on 524 keywords (check the ‘Adw Keywords’ column) which are driving traffic to the website. Lets see what these keywords are. Boom. I can see the keywords on which outdoorkit is bidding. The site is bidding on ‘water proof trousers’. This keyword is relevant to my site and i should investigate it further. So i just click on the ‘waterproof trousers’ link. Now i can see all the keyword data: avg. CPC, advertising competition, local monthly search volume etc. Through phrase match report and related keywords report i can get tons of keyword ideas. 1. Ability to scrap competitors’ Google adwords ad copies. You can dowload the ad copies your competitor is using for adwords ads into excel and then mine keywords or just get ad copy ideas. 2. You can find potential ad buyer and ad sellers for any domain. 3. One of the biggest advantage of using SEMrush is that this tool is available in different languages, you can access its API and you can use country specific version of Google to mine keywords. SEMRush uses different database for different country specific versions of Google. So set of keywords, avg. CPC, local search volume etc vary from version to version. The only downside of this tool is that it is not free. But then best things in life are not free. You can use the basic features for free but to get the full functionality (which you should) you need to upgrade to the pro account. If you think there are other keyword tools which can do the above tasks much better then please share in the comments below.